The Branched Chain Amino Acids Leucine, Isoleucine, and Valine are so called because the side chains of these amino acids (the part of the molecule that differentiates the amino acids) are made up of non-linear (branching) carbon chains. BCAAs are essential amino acids, meaning that they must be consumed in the diet (rather than manufactured in the body) and constitute more than one-third of the amino acid composition of skeletal muscle. 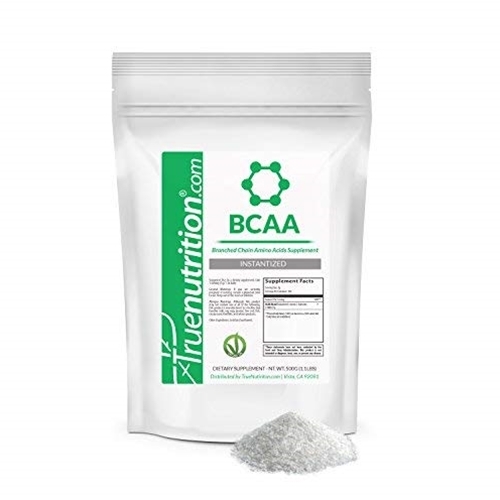 As a dietary supplement, BCAAs help support increased muscle metabolism and increased energy production, making them an ideal recovery aid following intense exercise.✝ True Nutrition's Instantized Branched Chain Amino Acids are derived from fermented plant-based ingredients, are entirely vegan-friendly, and have been instantized using sunflower lecithin for ease in mixibility! As a dietary supplement, take 1 Serving (5 Grams) 1-3 times daily. I agree with Levi, foamy and bitter. Just make sure and add a lot of sweetness to balance it out. I added 1 whole bottle (50 g) of Fruit Punch to a 500 g bag and it's still a little bitter, but I've had worse. This was my first order, I'll buy extra flavor next time. Mixes pretty good, still a fair amount of foam on top but nothing to really complain about. Taste wise I would describe it as slightly bitter-almost taste like coffee-but in no way is it a strong flavor; Its very tolerable ans can easily be masked. I would suggest purchasing one of True Nutrition's flavor pack(s), I've tried several and they're all great. Definitely a good deal; after you've added the flavor pack it taste the same as any BCAA supplement you're going to buy except you're getting 100 servings instead of 30 for the same price.